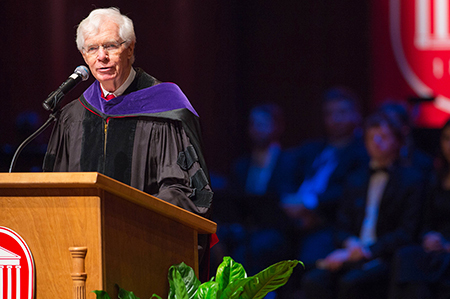 During its 165th Commencement on Saturday, May 12, the University of Mississippi honored former U.S. Sen. Thad Cochran (BA 59, JD 65) with its Mississippi Humanitarian Award, which is presented only rarely to exceptional figures who have played a major role in shaping the state. Cochran majored in psychology and minored in political science at Ole Miss, and was the head cheerleader and a member of the Phi Kappa Phi honor society. After graduation, he served in the U.S. Navy and later returned to campus to earn his law degree. Click HERE to view this story and more, courtesy of University Communications.